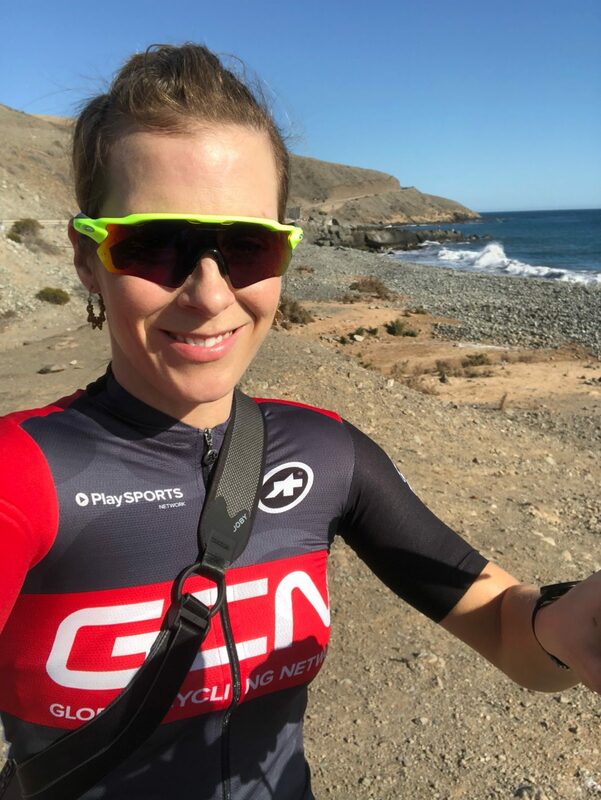 A few weeks ago I received some amazing news – both Dave and I would be going to Gran Canaria to attend Epic Gran Canaria, a two-day cycling celebration comprised of a night time Crit on Day 1 and a Gran Fondo taking in the best climbs on the island on the second day. To say that I like Gran Canaria would be an understatement. It’s hot and sunny at precisely the time of year that I’m starting to feel every so slightly gloomy about the cold, short days and getting tired of cleaning my bike after every single ride plus the cycling is absolutely superb. The beaches are plentiful, cafe stops serve fresh papaya and prickly pear juice, there are tons of cyclists around and the scenery is gorgeous inland – stretches of the coast can be a touch arid and featureless – think rocky peaks, trees festooned with pink blossoms, huge canyons and cacti. 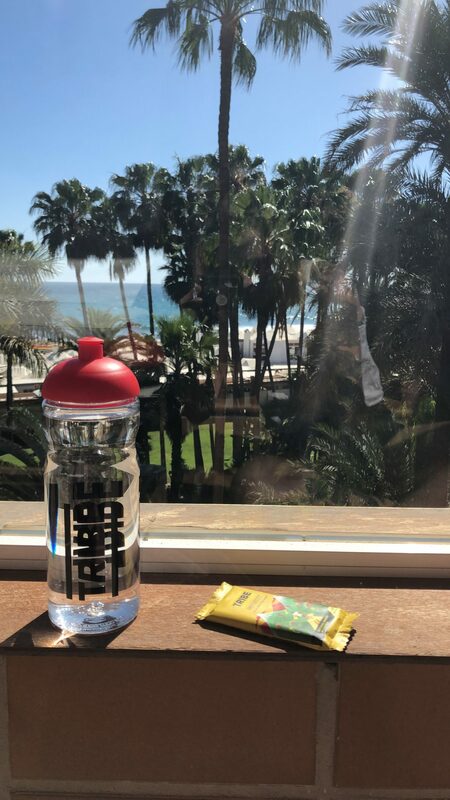 We were guests of Rui Resorts who sponsor a cycling team on the island as well as the event and they’d seen fit to treat us like Queen and King, giving Dave and I a week’s stay in a luxury hotel next to the beach, the Rui Palace Oasis in Maspalomas. Even the name sounds wonderful, right? And it was! When we checked in we were like overexcited children and not at all able to play it cool. I flung open our balcony doors I was greeted with a view the sea through swaying palms, the water a deep, glittering blue that seemed to say ‘welcome to paradise.’ We made haste to the buffet where I heaped every imaginable salad on my plate and enjoyed a glass of cava then retired to our room to build bikes and discuss the weekend’s racing. We were overwhelmed with joy at being in such a place and went to bed dreaming of our first ride out from our hotel and all the activities we’d planned for the week following. Dave had planned to race the Masters 30+ criterium on the Saturday then was going to be my wingman for the 130km Gran Fondo on Sunday, giving me a little shelter when I needed it and pacing me up the long climbs. We were both excited to try a new route on the island having been a couple of times in the past but never riding some of the roads we’d be following for the race. We’d four days of riding scheduled for the days following the event where we planned to film some videos, head up to Picos and enjoy a trip round to the other side of the island with Free Motion Bike Centre, our favourite tour guides. After three weeks of below average weather the sun had timed its appearance with our arrival. Things were looking good! But as with some of the best laid plans, things didn’t really work out quite the way we’d hoped, to say the least! I’ve published two videos from the trip (so far) so if you’re interested in finding out what went down you can watch the whole sorry story below! I’ll follow up with the next instalment shortly. Hello, next time come to Tenerife, it´s very close and the weather is similar. And we will give you replacement lenses for your Radar EV.